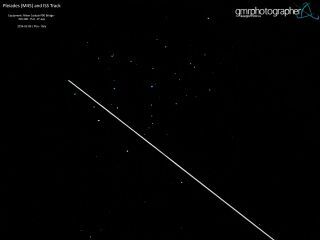 This image shows the International Space Station passing over Pisa, Italy with the blue Pleiades Star Cluster shining in the background. Giuseppe Petricca sent this image to Space.com on Feb. 10, 2014. The International Space Station streaks through the night sky over Pisa, Italy, as the bright blue Pleiades star cluster glitters in the background in this amazing photo recently submitted to Space.com. Amateur astronomer Giuseppe Petricca took this image of the Pleiades star cluster, which is also known as M45. It is an open star cluster formed about 100 million years ago and its brightest stars glow a hot blue color. Scientists estimate the young, recently formed stars in the cluster will burn out quickly, likely in the next 200 million years. The Pleiades cluster is a group of 800 stars located in the constellation Taurus, about 410 light-years from Earth. A light-year is the distance light travels in one year, or about 6 trillion miles (10 trillion kilometers).